WASHINGTON (CNN) -- Flowers arrived at Capt. Marissa Alexander's office at Fort Bragg, North Carolina, on June 3, 2005. 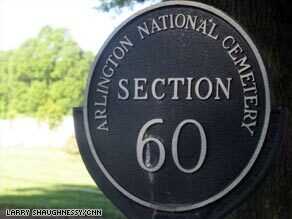 Arlington's Section 60 is the final resting place for many casualties of the wars in Iraq and Afghanistan. Her husband, Staff Sgt. Leroy Alexander, was half a world away fighting with the Special Forces in Afghanistan, but he had found a way to send a floral arrangement to his wife, who was five months pregnant with twins. "He called me and asked me what building I worked in. He said he had to update some records," Alexander said. The flowers lifted her spirits. But a few hours later, her emotions would be thrown into a tailspin. Alexander saw two Army officers in dress uniforms knock on her front door. One of the officers started to talk: "We regret to inform you..."
If he said any more, Alexander doesn't remember. "The next memory I have is in my kitchen, banging on the floor. I just couldn't believe it," she said. The good feelings from flowers delivered a few hours before were gone, replaced by shock, pain and mourning. A roadside bomb had made her a widow. Staff Sgt. Alexander now lies in Arlington National Cemetery's Section 60, where 500 soldiers, Marines, airmen and sailors who have died in Iraq and Afghanistan are buried. Then there are family and friends who come to the graves to make an emotional connection to their lost loved ones. Memorial Day weekend brings even more activity and more visitors. Adults, even some uniformed generals, walk slowly between the rows and rows of headstones, looking for a familiar name. But small children often seem to find the cemetery a place to explore, even play. Their smiles and curiosity remind grown-ups that even in a place synonymous with death, life goes on. A sense of community has emerged in Section 60. "I've come here at times and I've met people who were paying remembrances to their loved ones. You become friendly," Capt. Alexander said. "You see each other sometimes and you make a friendship because you know that your loved ones died for the same cause." Angie Capra's husband is buried a few yards from Leroy Alexander. Air Force Tech Sgt. Anthony Capra was an explosive ordnance disposal expert, killed trying disarm a bomb in Iraq. "Other widows will come by and put something on there for me if they don't see me. They'll put down flowers. It's kind of a community," Capra said. Capra recently found a small Yoda figure on her husband's grave. She doesn't know who left it, but it must have been a friend, because her husband loved "Star Wars." "We never know who puts stuff" on the headstone, she said. There is another topped by a small Lego toy, perhaps left by a child whose father died in a far-off land before they even knew each other. Or the grave adorned with an empty bottle of Bud Light, a rubber duck and a candle. Nearby an empty Wild Turkey bottle is the lone addition to the grave of a soldier who died in a country where drinking alcohol is strictly forbidden. Capra has found a variety of items on Tony's headstone. "Coins, lots of rocks, candy. My husband was a candy freak," Capra said. "There was a cross. A little necklace, Mardi Gras beads during Mardi Gras season. Anything they have they'll put on top to show that they are thinking about them at the time." Alexander seems to draw strength from the items she finds. "Someone came and did a picture of Lee, and it was a hand-drawn picture. I thought that was very interesting," she said. "People who haven't been seen in years will leave a note of some sort. It's nice to know that you've been remembered after all of this time. To know that we have friends who still love and support us, that is just wonderful." Section 60 has been called the "saddest acre in America," and without a doubt sadness abounds. But so do comfort, support and even an occasional smile.